Intragastric Balloons for Obesity – A Novel Technique for More Secure, Quicker, and Less Expensive Office Placement and Removal – the First 138 Ballons. BACKGROUND: Although bariatric surgery is the fastest and most effective way to lose and control weight, some overweight patients are not eligible for this procedure. 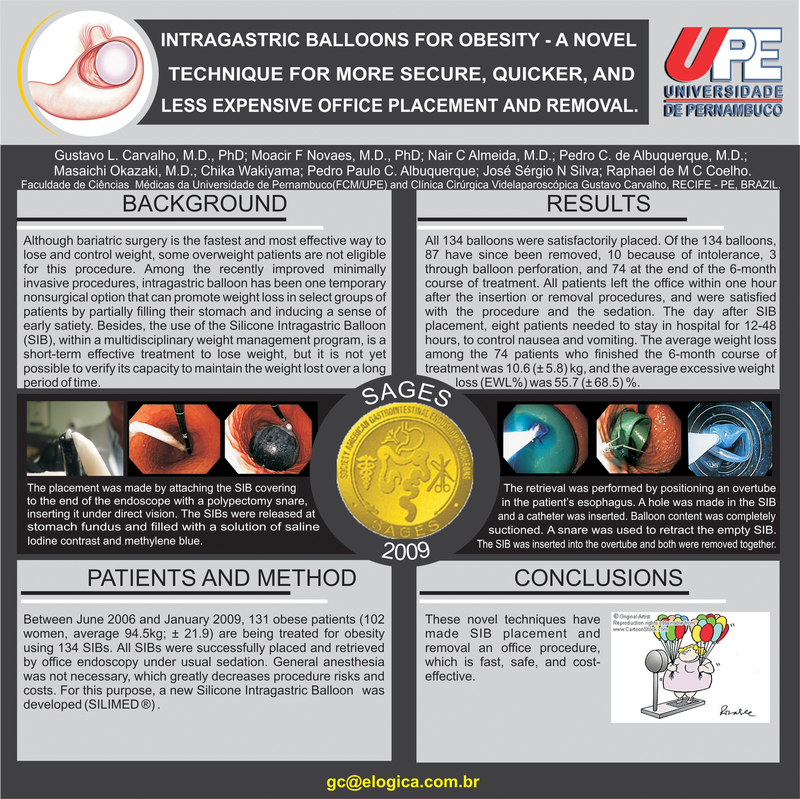 OBJECTIVE: To report improvements made in the technique for office placement and removal of Silicone Intragastric Balloons (SIB). MATERIAL AND METHODS: Between June 2006 and September 2008, 117 obese patients (93 women, average weight 94.5kg; ± 21.9) underwent treatment for obesity using 138 SIBs. All SIBs were successfully placed and retrieved by way of office endoscopy under normal sedation. General anesthesia was not necessary, thereby greatly decreasing the risks and costs. For this purpose, a new Silicone Intragastric Balloon was developed (SILIMED ®). Placement was carried out by attaching the SIB with a polypectomy snare and inserting it under direct vision. The SIBs were released at the stomach fundus and filled with a solution of saline, iodine contrast and methylene blue (470-850ml). Retrieval was performed by positioning an overtube in the patient’s esophagus. A hole was made in the SIB using a needle and a catheter was inserted. The entire contents of the balloon were suctioned completely. A snare was used to retract the empty SIB. The SIB was partially inserted into the overtube and both were removed together. RESULTS: All balloons were satisfactorily placed. Of the 138 balloons, 80 have since been removed, 10 because of intolerance, 6 through balloon perforation, and 64 at the end of the 6-month course of treatment. All patients left the office within one hour after the insertion or removal procedures, and were satisfied with the procedure and the sedation. The day after SIB placement, 28 patients needed to stay in hospital for 12-48 hours, to control nausea and vomiting. The average weight loss among the 64 patients who finished the 6-month course of treatment was 11.3 (± 6.2) kg, and the average excessive weight loss (EWL%) was 55.1 (± 68.5) %. CONCLUSION: These novel techniques have made SIB placement and removal an office procedure, which is fast, safe, and cost-effective.